Gurgaon-based startup True Balance, an app that allows users to check their mobile phone balance, has raised Rs 100 crore ($15 million) in a Series B round led by existing investor SoftBank Ventures Korea, part of Japanese Internet conglomerate SoftBank Group Corp, and IMM Investment Group. Other South Korean investors such as Mega Investment, Korea Development Bank and Capston Partners also participated in this round, a statement issued by the firm stated. A report in The Economic Times mentioned that investors now hold10-15% stake in True Balance. "The additional funding will help us spur our business growth even further. True Balance has been growing exponentially, passing the 30 million download mark and targeting 100 million by the end of this year," Charlie (Cheolwon) Lee, founder and chief executive of True Balance said in the statement. In March last year, True Balance had raised an undisclosed amount of investment in a Series A round of funding from SoftBank Ventures Korea. Prior to that, the startup had earlier secured seed funding from Korean VC firm Bon Angels Partners and Mega Investment. SoftBank Ventures Korea was established in 2000 as a subsidiary of SoftBank Group. "Within the first year of investment, there was 3000% growth in app downloads, and this denotes the company's growth. Due to rapid expansion of the Indian market, the company's estimated potential seems to be even greater," said Gyu Hak(Greg) Moon, the president and chief executive of SoftBank Ventures Korea in the press note. True Balance, operated by Balance Hero Co Ltd, was launched in September 2014 by Lee, an alumnus of the University of Chicago. The Korean entrepreneur came to India in 2002 and led the India business for Real Networks, an Internet streaming media delivery service. 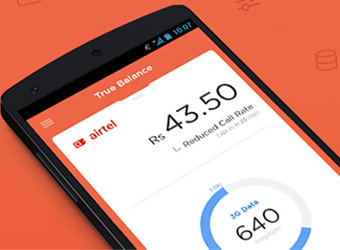 The True Balance app allows prepaid Android smartphone users to check their mobile and data balance, without an Internet connection. It also offers a recharge service. The mobile recharge segment is dominated by payment companies such as Paytm, Freecharge, and MobiKwik. Other apps such as Smartapp, BillBachao, and Mubble use analytics in the backend and help consumers track various metrics of usage and save on bills. Recently, SoftBank Corp had launched a $100 billion tech fund called the SoftBank Vision Fund. Apple Inc. is investing $1 billion in the fund, which is also likely to see participation from Foxconn Technology Group Ltd and the family office of Larry Ellison, chairman of Oracle Corp. The Fund will be SoftBank's primary investment vehicle in India. In India, SoftBank has investments in unicorns such as Hike, Ola, Snapdeal and InMobi. During a visit to India late last year, SoftBank chairman and managing director Masayoshi Son, re-emphasised that he continues to be bullish on India and even believes he will surpass his own commitment of investing $10 billion in India in 10 years.